The next step in installing turf (after measuring) is crucial to the health of the new lawn you are about to install – preparation. 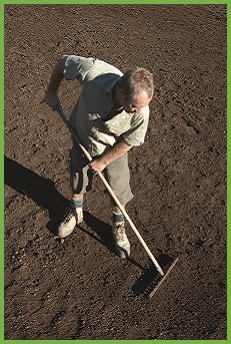 Using the Harden Park Lawns simple steps, you will have all the knowledge to prepare for your new turf the right way. If you are undertaking a complete garden overhaul or starting from scratch, then finish off the rest of your elements in your new yard first – garden beds, retaining wall, paved areas, paths, driveways. A turf underlay is a specific blend of organic materials and top-soil blended so that your new lawn will have the optimal balance of mineral and nutrients. You can order your turf underlay from Harden Park Lawns, for delivery along with your turf. You will need to order enough underlay to have an evenly distributed depth of approximately 100 – 150 mm. See our previous blog on how to calculate how much underlay to order. This is also a good time to even out the area and ensure that the levels are correct for the right fall from drainage. Determine if the yard need excavating or filling and check for drainage issues. Install agricultural drainage pipe (ag pipe) if required. Now your yard is all prepared for you to install your new turf. For your new turf lawn or additional lawn care advice just contact the team at Harden Park Lawns.